This book is a must for amatuer historians and geneologists. It provides a great snapshot into the life of families, through birth, marriage, immigration and death records. 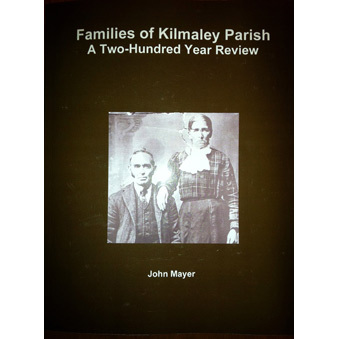 What began as a continuing desire to research my family ancestry in Kilmaley and Inagh Parishes, in County Clare, has spawned the publication of "Families of Kilmaley Parish - A Two-Hundred Year Review". While completing research over the past five years, I would continue to encounter other researchers who were thirsty for information on their ancestry, also in Kilmaley. Having been a regular visitor to Kilmaley over the past 45 years, ironically I would know many of the families, people were researching and in some cases would be able to provide photos and addresses of relatives, to people all over the world. It became clear to me that there were many people looking for information about Kilmaley. My intent in completing this 633-page book, was to give more researchers a starting point to begin researching their families. The information contained in the book represents a small snapshot of life in the parish from the late 1790's through the 1990's. However the book does not represent all families in the region, so I do have additional information if readers do not find their families. I may be able to help them, if they wish to contact me. I hope readers find the book as enjoyable as I did in putting it together.